Today I was doing my final preparations for the Direct Connect HOT Seat panel that I'm moderating next Monday at GBTA in Denver. 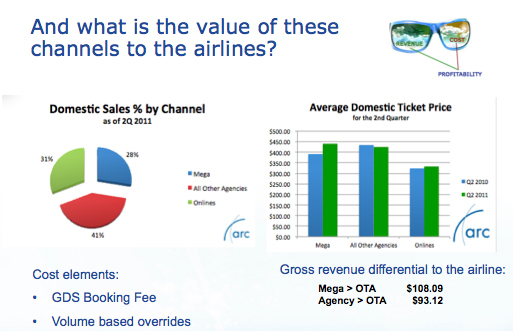 I put together a couple of slides based on ARC's 2nd quarter data that I would like to share with my loyal blog readers as a "sneak peak" at the airline channel shift picture. The Airline Reporting Corporation, owned by the major airlines in this country, has been a venerable source of data for airline tickets sold by the retail and wholesale channels in the US, including both brick and mortar agencies and their online counterparts, known as OTAs. As airlines create booking environments outside of that settlement infrastructure (such as an agency portal for their website), these numbers will be missing that critical element of activity. Here is the DOMESTIC picture as of 2Q 2011. As far as channel split, the brick and mortar agency community is responsible for 69% of all domestic ticket sales settled through ARC (28% done by the mega TMCs and the balance done by the other 14,300 some ARC approved agencies) and the OTAs bring in the other 31%. 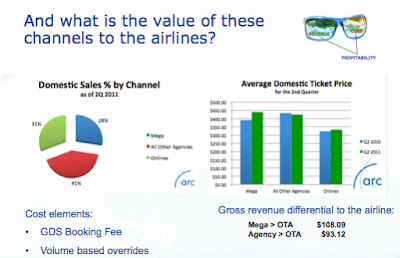 Where it gets interesting is in looking at the differential between the value that an airline gets for the agency transactions and what a ticket is sold for on the OTAs. Remember this is the aggregate of all tickets sold on all carriers by all agencies in the category, it is not to say that mega agencies or travel agencies charge more for the SAME ticket. Ticket prices through the Mega and OTA channels were up 13% and 3% respectively from the same quarter last year and agencies sales were down 2%. Keep in mind that the airline direct sale through their web site likely looks more like the OTA rate than the agency rate. So when the airlines do their math, even deducting a GDS booking fee and any volume based overrides that they might pay to the agency channel, they have a pretty good starting place before they deduct those fees. This is a very different picture. The average MEGA ticket value is up 9% from the same period last year and the brick and mortar agents are up 11%. Even the OTAs are up on this front 8%. 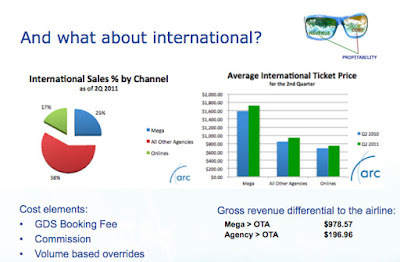 The OTAs are only responsible for 17% of international air ticket sales and it is a good thing for the airlines, as the differential on revenue from the mega-TMCs is so stark and even the incremental revenue garnered through the brick and mortar agency channel gives the airline a substantial amount (nearly $200 on average per ticket) to work with in paying for their distribution costs. 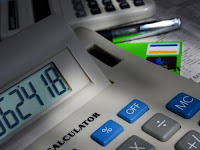 As always, whether you are an airline, an OTA, a corporate travel manager, a TMC or an agency, or the GDS that aggregates all these high value transactions on behalf of your airline customers, you need to know your own numbers on each of these fronts and how you compare to the average processed through ARC. The bottom line? KNOW YOUR NUMBERS. If you don't know your numbers, you can't make decisions. I am not opposed to shifting channels when the resulting profitability increases. That is business 101. I do have a huge problem with the "follow the crowd", emotionally charged approach to channel shift that is drive solely based on the COST side of the equation, without taking into account the REVENUES generated through different channels. So sellers, DO THE MATH before you try to shift your channel strategy, putting an incremental burden on your distribution partners. And buyers, before you let a supplier shift their as it relates to your business, make sure that you know what you bring to the table for them. That is all that I ask.